Home » News » Dr. Kopp Delivers Marshall State of University Address in Washington, D.C.
Dr. Kopp Delivers Marshall State of University Address in Washington, D.C.
HUNTINGTON, W.Va. – Nearly 200 Marshall University supporters, including members of West Virginia’s congressional delegation, joined Marshall’s president, athletic director and football and basketball coaches at the nation’s capital Tuesday, June 21, to celebrate the university’s recent growth and expansion projects now under way. 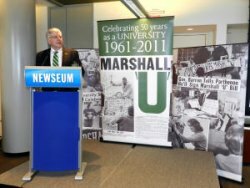 The crowd, which included many Big Green members, gathered during Marshall’s annual State of the University address and reception at the Newseum in Washington, D.C. The Newseum is an interactive museum of news located at 555 Pennsylvania Ave.
West Virginia’s congressional delegation includes Senator John D. Rockefeller IV, Senator Joe Manchin, Representative Nick Joe Rahall II, Representative Shelley Moore Capito and Representative David McKinley. Kopp met earlier in the day with all members of the delegation to discuss the university’s priorities and concerns on the federal level. Kopp, who has been at Marshall for six years, spoke of the importance of setting high expectations, of the importance of higher education and the attributes of college graduates. 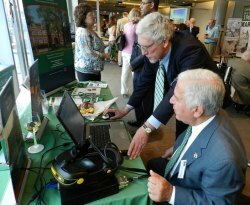 He updated the audience on the university’s progress on many fronts, including planned new facilities such as the Biotechnology Incubator and Applied Engineering Complex, the Fine Arts Incubator and the soccer complex; record enrollment; new programs of excellence, and campus improvements, such as the modernizing of all classrooms. Manchin and Rahall each spoke at the event. Marshall coaches Doc Holliday and Tom Herrion, and Athletic Director Mike Hamrick, spoke about the university’s commitment to excellence in athletics, with an emphasis on academic achievement and stringent team standards. Ten of MU’s 14 sports teams had a grade point average of 3.0 or better for the spring term.